The earliest works of the Clerk's Press bear the imprint "Grace Church Press." ...Between 1908 and 1919, Bubb produced on a hand-operated press, now vanished, a series of remarkable scholarly and typographic works. ...He produced limited numbers of his very attractive works, he colored many of them by hand, and he used a wide variety of unusual print devices to enhance the attractiveness and typographic interest of his publications. This is a catalog printed to accompany an exhibit of the works of the Clerk's Press. If you are interested in American fine press books from the Arts and Crafts period, this is the most important book you can get. It has surprising depth in its analysis of the presses, designers, and printers working under the influence of William Morris and the Arts and Crafts movement. The Clerk's Press is briefly mentioned. A good overview of private presses in America, England, and Europe. This is my second favorite general reference for fine press books. Not as much depth as Susan Otis Thompson's book, but has a couple of great chapters on English presses (such as the Kelmscott, Vale, and Doves presses), and other chapters on presses in Europe. 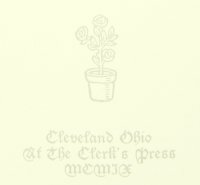 This book is mainly a checklist of private presses and the books printed by those presses, but there are some interesting tidbits about the different presses. Many of the checklists are not complete. The Clerk's Press checklist lists 71 items and notes that "the press has produced 124 minor pieces in connection with parish work..."